Emil Seligman was born in Germany in 1858. He is a relative of Solomon Sweet, the senior member of the firm, Levis, Sweet & Co., and one of the oldest and most favorably known businessmen of Tulare County. Emil Seligman of the firm of Levis, Sweet & Co., in the town of Traver, 13 miles from Visalia, is one of the many intelligent and enterprising business men which Germany has furnished the United States. Mr. Seligman was educated in his native country and there served a three years’ apprenticeship to the dry-goods business. Emil Seligman came to California in 1875, being first employed as a clerk in the store of S. Sweet & Co., his present partners. In 1880, he engaged in the mercantile business at Hanford, in partnership with J. S. Philips, of the firm of Philips, Sweet & Co., and was there until 1883, when a disastrous fire swept them out of business. He then returned to Visalia and clerked for S. Sweet & Co., being sent by them to Traver, in 1884, when the town was just starting, to run a lumber business. In 1887, the business was sold to the San Joaquin Lumber Company, after which their present company was organized and business es­tablished, Mr. Seligman being the sole manager of the business from its beginning. 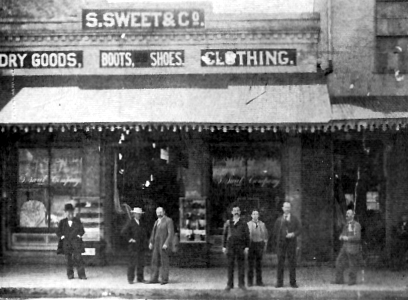 S. Sweet & Co. handles a large amount of general merchandise, including furniture and farm implements, and has a large patronage, which was established and is sustained by their honorable methods of doing business and their courte­ous treatment of all. They first built a store, 50 x 100 feet, and have in connection with it several warehouses. As these facilities are not sufficient to meet the demands of their constantly increasing trade, they contemplate in the near future building a more commodious place of business. In 1891 a fruit-packing business was established on the co-operative plan, and named the Traver Fruit and Raisin Company, of which Emil Seligman was elected as Treasurer for the first year, and by whose efforts in a great part it may be said that the enterprise was started. Mr. Seligman is a man of fine business ability and has made some paying investments in lands in this county. He owns 300 acres of valuable land, and has erected one of the best resi­dences in Traver. Another business enterprise with which Mr. Seligman is connected is the Del Lante Hotel, he being a stockholder, Director, and Treasurer of the company that built it. Emil Seligman is a member of the Ancient Order of United Workmen, The International Order of Odd Fellows, and the Knights of Pythias. Emil Seligman married Anna Frey in 1887, a native of Switzerland. Their union has been blessed with three children—Milton, Ruth, and Louisa.